i'm not around much at the moment as i'm temporarily working 2 jobs in my non-G time. G's only napping about an hour in the day and going to bed around 9, so in what time i have to myself the crafting is getting priority and the blogging is taking a back seat. this is what it's been taking a back seat to this week. 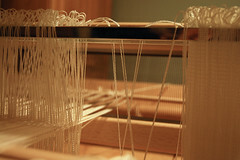 i got me a louet kombo 4-shaft table loom, the big one - 70cm/28" weaving width. i'm about two thirds through warping it after working on it all day yesterday, and i doubt i'll get to do the throwing the yarn back and forth bit - which i always through was weaving but turns out to be about a quarter of weaving - until the weekend.